TWITTER – It is a micro-blogging website where we can tweet a maximum of 140 characters. Twitter is used by the B2B brands to broadcast about their acquisitions, jobs, trainings, conferences, or latest news about the company. B2B brands can use their twitter profiles to tweet about the latest developments in their domain, about the new technologies, latest innovations etc. Now, how to start on this? 1) First make a list of yours and your competitors’ twitter handles. 2) If any of your competitors don’t have a domain-specific twitter profile, then ignore it. 3) Make a list of their current followers/followings/lists. See how these metrics are changing on a weekly/monthly basis. 4) Check their followers list. Is there any technology expert or a thought leader which you can also follow? 9) Set up a weekly report with all this data. So, we are done with our format of report. What next? Analyze the report carefully. Make a strategy for your brand on twitter from the above dashboard. Let’s take the chart one by one. 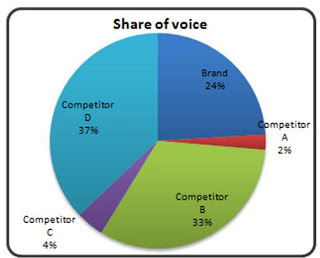 This chart shows that you are at 3rd number in terms of Share of Voice. Quite sad! But don’t worry; we will help you in increasing the share of voice of your brand. 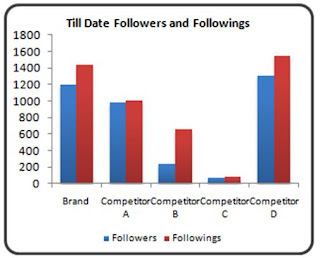 This chart shows the followers and followings of your brand and competitors till date. • Competitor D has highest share of voice and highest followers and followings. 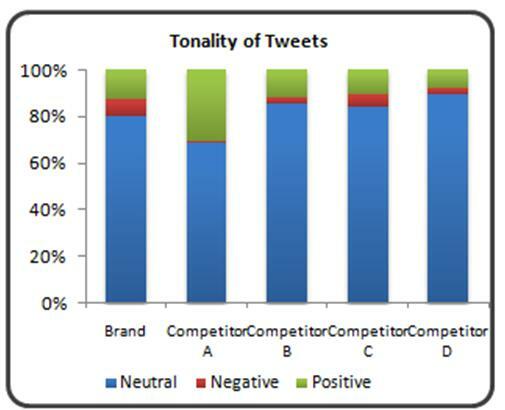 • Competitor B is having second highest share of voice but stands 4th in terms of followers. It means even though they have lesser followers, they have quality followers. Quality means they have followers of their domains, who are active and are listening. Keep adding followers of related domains in large numbers. This chart shows the week-on-week trend of followers. • Competitor ‘D’, which was behind your brand in terms of followers, is now having highest in week 4. This shows that they are continuously working on their brand’s share of voice on twitter. • The growth trend of Competitor ‘A’ that was not showing for the last 3 weeks, now shows a sudden increase in week 4. 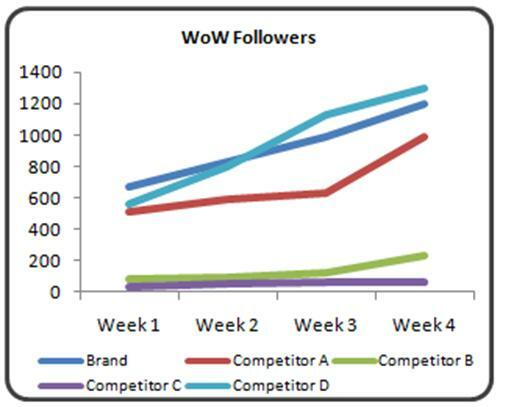 Is there any news about that brand in week 4 which increased so many followers, or have they started Social media marketing? Keep putting your effort in increasing your share of voice. Don’t give up even if you are not seeing any results. Try to correlate the increase in followers list of the competitor with their news. It will help you to foresee the number of twitter followers might increase for your brand if you tend to create the same news. • Competitor ‘D’, which is having the highest share of voice is tweeting more about domain-specific articles. They are more interested in tweeting about the latest news, changes, and innovations in your brand domain. Your clients or CXO’s of your prospects will be very much interested in these types of articles as they are from same domain. • Competitor ‘B’, which is having the second highest share of voice is tweeting more about the blogs of their own. • Competitor ‘A’ is tweeting more about the company news. This adds a human touch to your twitter account. • Tweet about the latest news in your domain. Subscribe to online newspapers, blogs on same domains etc. Try to tweet in real time. • Hire a content writer. Keep writing articles about your domain on your website/blog, and then tweet those articles. • Tweet about latest news of your company, press releases, add pictures, so that you can bring human element to your twitter account. This chart shows the tonality of tweets. • Your Brand is having the highest negative tweets as compared to competitors. • Competitor ‘A’ is having the highest positive tweets. • You should not ignore negative tweets even if they are less in number. Each and every negative tweet matters. See why someone is tweeting negative about you? What they are talking about in their tweets? Should we reply back to them or ignore. What is the best way to reply to them? • Try to analyze why there are so many positive mentions for Competitor ‘A’. Which types of their tweets are getting retweeted? Are they related to company news or domain-specific? 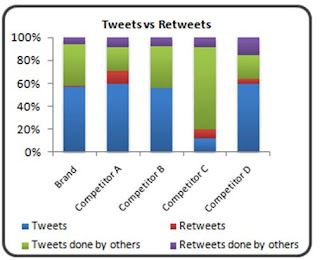 • Competitor ‘C’ is having the highest numbers of tweets which are done by others. • Competitor ‘A’ does a lot of retweeting. Follow domain-specific people on twitter. Communicate to them by twitter. Try to retweet their tweets through which you become visible to them. These people might be in turn interested in retweeting your tweets. 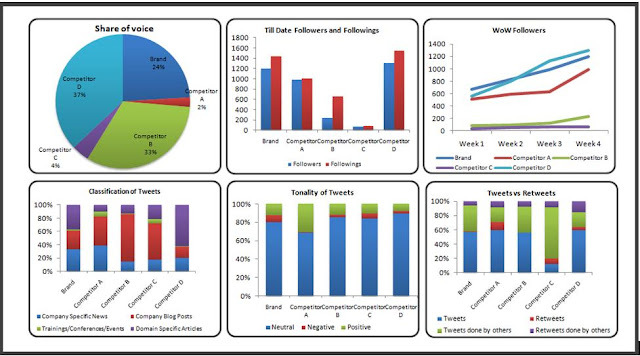 So, we are done with setting up Twitter weekly report, getting insight from the data and action plan. There are so many studies regarding the best time to tweet. But still, we are not sure about it. It totally depends on which geographical area our listeners belong to. So, don’t go by the theories on web. Run your own experiment. Take 3 tweets, tweet on 3 different time zones, and analyze after one month which tweet got maximum clicks or got retweeted. Make a list of your target companies. Search for their CXOs or technology experts on LinkedIn/Google. Find out their twitter profiles and then start following them. Set a target how many you have to follow in each month. 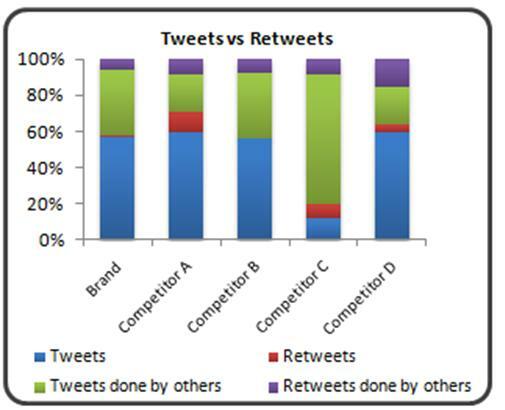 Now we have figured out where your brand is currently on twitter as compared to your competitors. In next blog post we will set target for your brand so that in few months your brand will have highest share of voice on twitter platform. Really Insightful. One thing that I want to know the the tweet classification was done manually or you used some automated tool to do that. 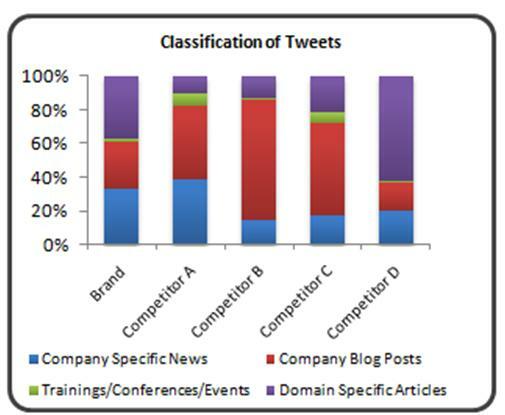 Most of the big brands may have thousands of tweets so manual classification is not an efficient way. Is there any workaround for the same. @Suchet, We have built our own tools to classify tweets. You have to identify the kewyords for classification and then you can easily do in Excel also. 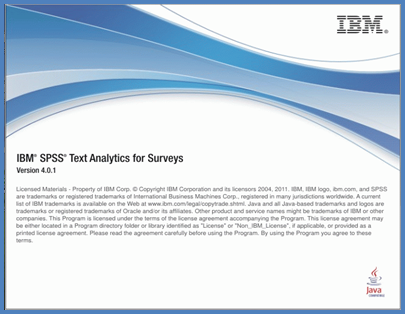 May I know, do you guys use word stemming, semantic grouping of words, and syntactic word correction as a part of cleaning process, before going to classification modeling phase? Before analysing the social data we do stemming, semantic grouping etc. These are must specially in social media/web data.